I have way too many sewing projects started. The quilt guild that I just joined issued a New Year's challenge: to finish 5 unfinished projects by June. We were to list and describe them, formulate a plan of action, and sign a contract. I started listing projects and submitted 14, I think. After the meeting was over, I started writing more projects on the back. There are approximately 45 projects listed so far, and I'm embarrassed to admit how many I knowingly left out. 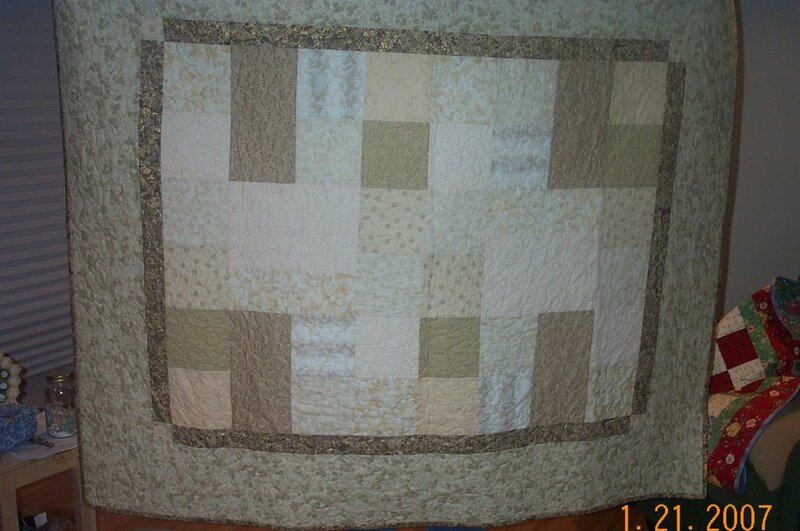 Another scrap quilt from my 2-inch squares collection. This is the first time I used scrappy neutrals. I'm not sure if I like it, but I am certain that it's DONE! 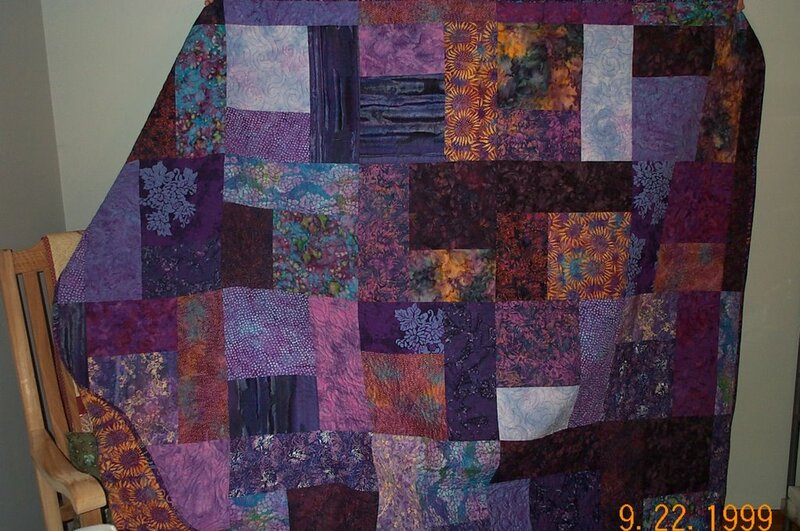 Here's another quilt from the church quilt group. It just needed a binding. Da da dum, dum, dum, another one bites the dust. Will be delivered Monday. 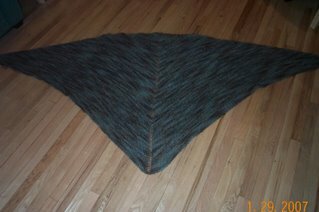 At long last, I finished the very yummy wrap. I'm not sure of the fiber content (mohair/wool? ), but it's absolutely delicious. I just had to wear it to church this morning. I was toasty-oasty warm. I'm wearing it now, 'cuz I can. Eventually, I'll make the dress I bought this to match. Holding your breath would be ill-advised. Oh, and the picture doesn't show how absolutely HUGE this thing is. The point in my back goes to my knees. 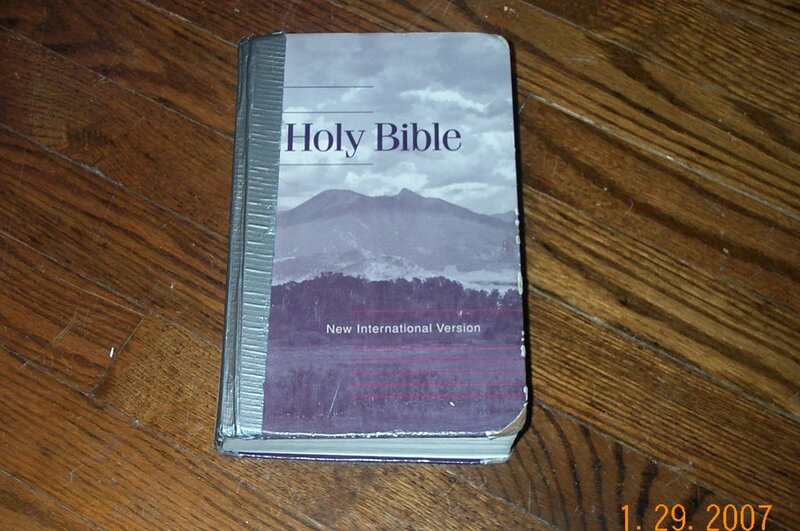 My Bible ended it's usefulness this morning when Genesis fell out -- Page. By. Page. I had previously taped larger sections back in the binding when they fell out, but I cannot rationalize taping 20 single pages -- especially when each time I touch it (even to tape it) the next page falls out. So, I am auditioning a different Bible. I'm very resistant to change and I'd like to learn to be more flexible. I'm not going to buy another copy of this exact Bible until March 1st. I'm going to MAKE myself try and get comfortable with another Bible. Wish me well! For those who are paying VERY close attention, these will be the last pictures with the wrong date. I finally fixed it. Wait until next week for proof. I desire to seek the way that shall become a delight to my heart for it will bring me to the fires of human-kindness lighted by those who have gone before me on the Camp Fire trail. I was a Camp Fire Girl. Not just a Blue Bird in grade school, either. I went all the way through until I finished high school. I earned my WoHeLo Medallion the same time my brother-in-law earned his Eagle Scout. Thirty years later I still remember this, but if you ask me my cell phone number, I'm clueless. Thirty years later, I'm finally trying to do part of this -- the finishing part, of course. It will probably be a wedding gift. 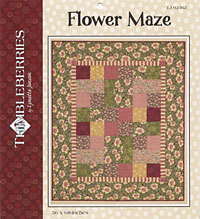 Great pattern -- check it out. Remembering my Camp Fire credo, I finished it the next day instead of adding it to the UFO pile. 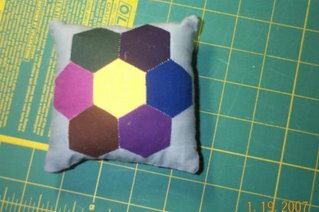 (BTW, it's a pincushion). We live in the woods. I mention that often. 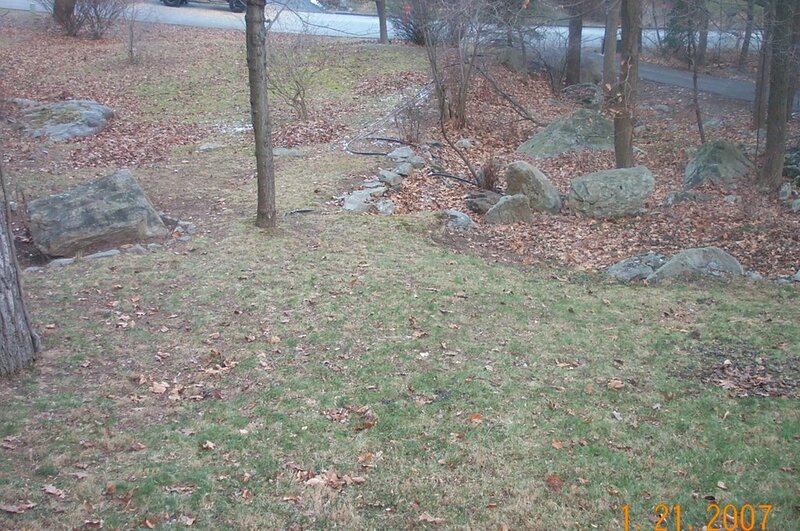 We have a sizeable front yard (about an acre). To say that we have a lot of leaves to rake is an incredible understatement. We've been in this house for about five years, and not once have we (meaning, my husband*) completely raked the front yard. I'm sure we are the subject of much neighborhood talk, being the new trashy neighbors who don't take proper care of their yard. We've concentrated on much more frivolous matters in our time here, such as plumbing, the well, missing floors and ceillings, heat issues, a roof, etc. Maybe someday we'll work on the yard, but I wouldn't hold my breath. A lot of our neighbors have their houses close to the road with manicured front yards -- we're further back and feel like God does the landscaping so why should we bother? Anyway, we had some wonderfully warm days around Christmas (like 70 degrees!) 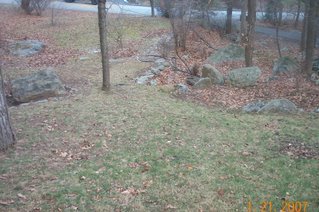 and while I was inside coughing and sneezing and generally feeling lousy, my husband spent much of his Christmas vacation outside raking. He didn't finish the yard, but it looked much better than it ever has since we moved here. I'm so proud of him and his efforts. The unusually warm winter has given him many more opportunities to tend the yard. Thursday night, something strange happened. White flakes began falling from the sky. We weren't sure exactly what it was, but it sure was pretty (and the unraked leaves were hidden from sight). Will the leaves be once again covered in white? Or will it return to leaf-raking weather? I have no idea, so stay tuned. Please notice that the date on my camera has been changed. Unfortunately, I cannot read a calendar, so the date is one day ahead. Maybe I'll try and fix it again, or maybe I'll pop the batteries out and let the date return to 1999. We'll see. *in case anyone had ideas that I, possibly, could help rake the yard, please think again. 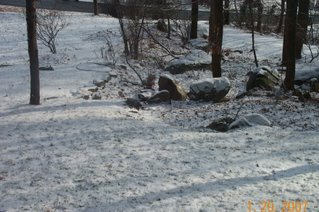 I am a married woman with a credit card and a cell phone: I don't plunge, shovel, rake, or change tires. I can, however, restart our furnace in less than 45 seconds (just in case I seem completely useless). When I'm sick, my home remedy is to sit in front of the fire, watch CSI and sew. While sick over Christmas, I spent several days attempting to empty some of my scrap buckets, but to no avail. 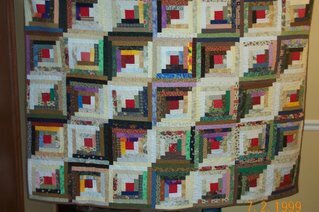 I finished a quilt, but the buckets are still full! Someone must be sneaking in here at night to refill my scrap buckets. Seriously. 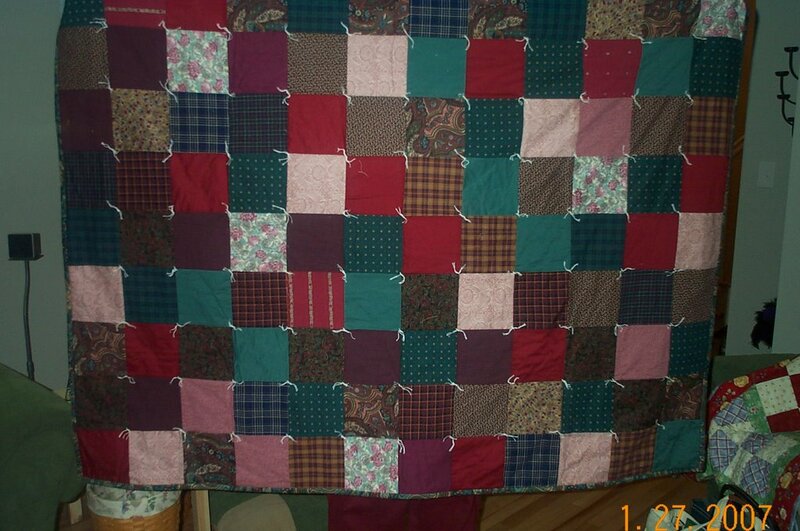 Anyway, I made a scrap quilt to send to my son for his college friend. 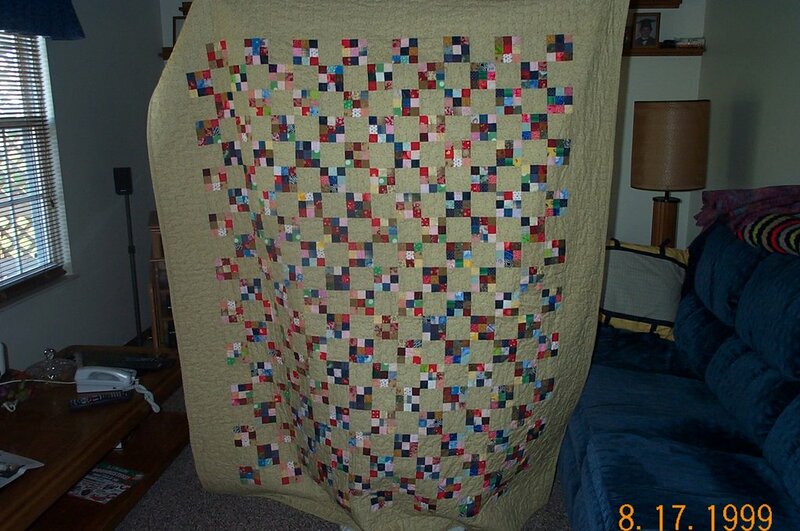 I was so efficient in this that I mailed the quilt without taking a picture of it. 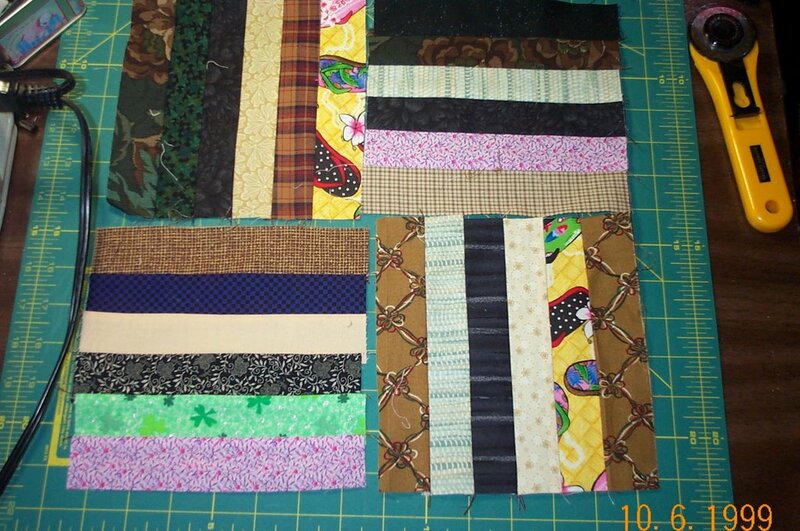 Here is a pic of a few leftover blocks to give you an idea of the quilt. 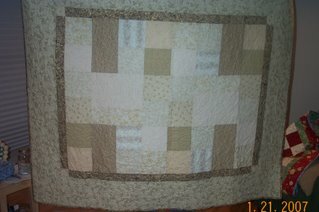 The quilt is all from my 1-1/2 inch scrap bucket (small bucket yields many quilts, grasshopper). 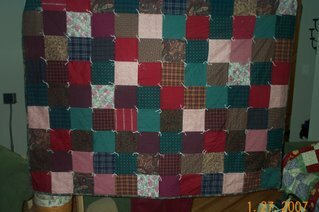 The real quilt is a little more colorful -- I pulled out the duller blocks. 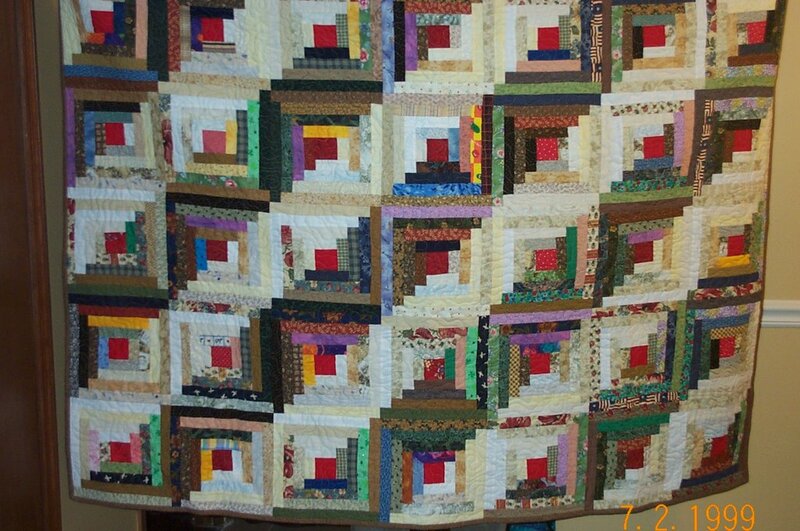 I've recently realized that I'm a huge fan of scrap quilts. 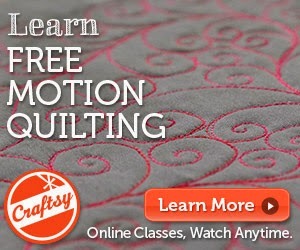 It's almost like I sew and the desired product is SCRAPS rather than a quilt. Sick? Probably. 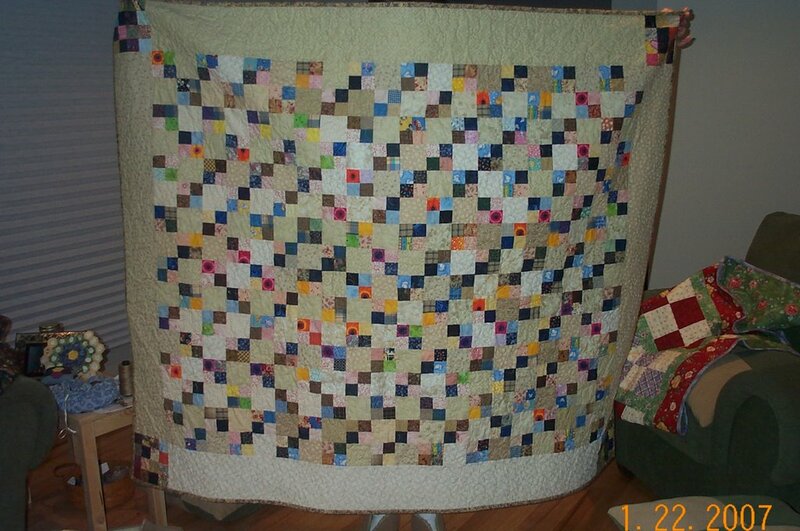 I made this quilt last year sometime as a sample for the local quilt shop and just recently brought it home. It's new home is in my living room and I adore it. 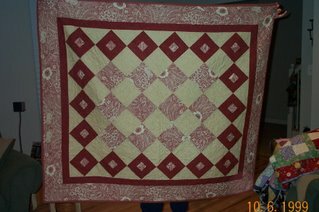 I'm quite a fan of red (such a shock to those who have lived through my red quilt phases in the past, I'm sure). The camera is now empty of quilt photos. Off to produce more scraps. Have you ever completely lost track of time? I have. Anything that happened between September and New Year is all one big haze. I'm starting to pull photos off my camera from that haze. This is one from the gift pile. I made it from my 1-1/2 inch strip bin. It's been done a long time but I gave it away last fall. A woman in my Bible study group fell down and broke both of her legs. 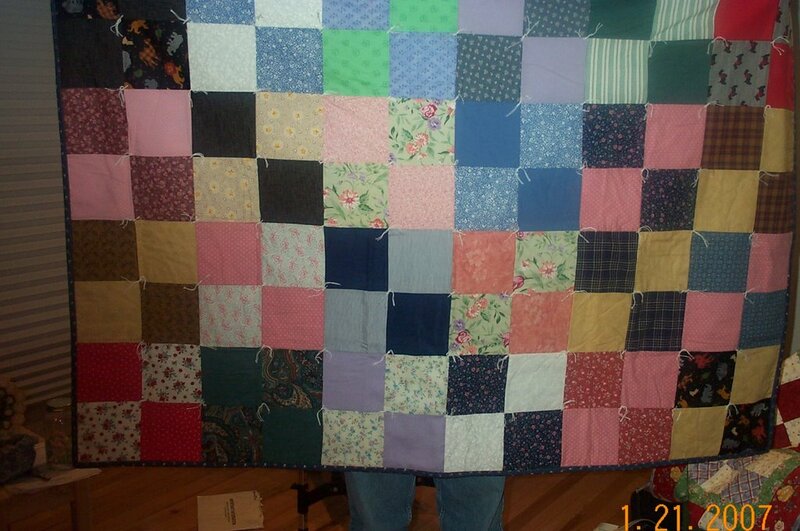 I hope this quilt brightens up her rehabilitation. My husband's co-workers got married in October and I gave them a cream Turning Twenty quilt. I guess I took this as a before picture. I never got around to an 'after' picture. 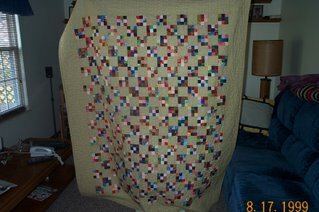 This next quilt was a 'why didn't I ever finish this?' project. 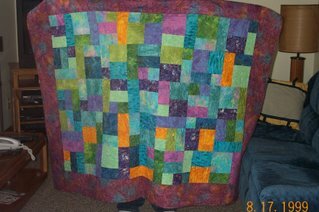 I pieced and quilted the quilt one weekend maybe last summer, but I never bound it. 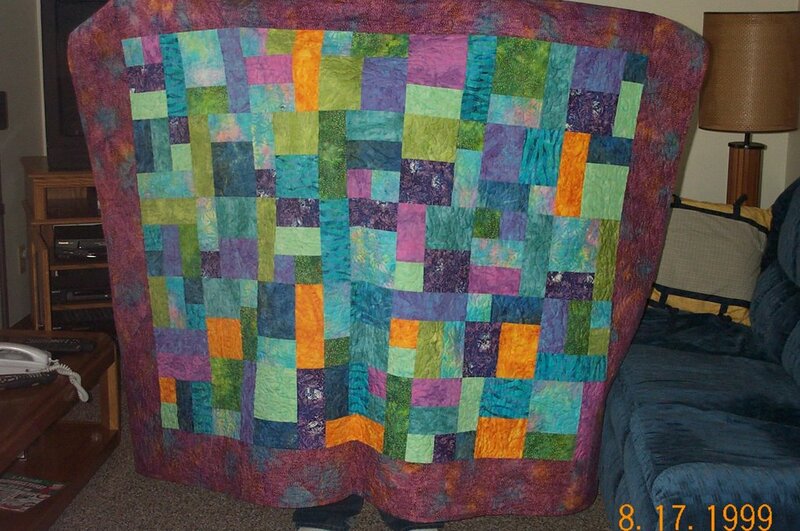 Another set of my husband's co-workers got married and I quickly bound this quilt for their wedding present. This is another one from the gift pile. 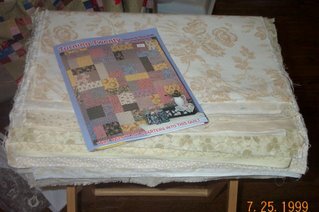 I took six 1/2-yard cuts and made a quickie rail fence a year or so ago. My husband's little cousin had another baby so this went into the mail. This cousin was 8 years old when I started dating my husband, so it's just WRONG that he's now old enough to be a really wonderful man with 2 children. Wrong, I say. My poor mother-in-love has had two hip replacements in the last few months. She is recovering well. She was in so much pain before that the surgeries were an immediate improvement. 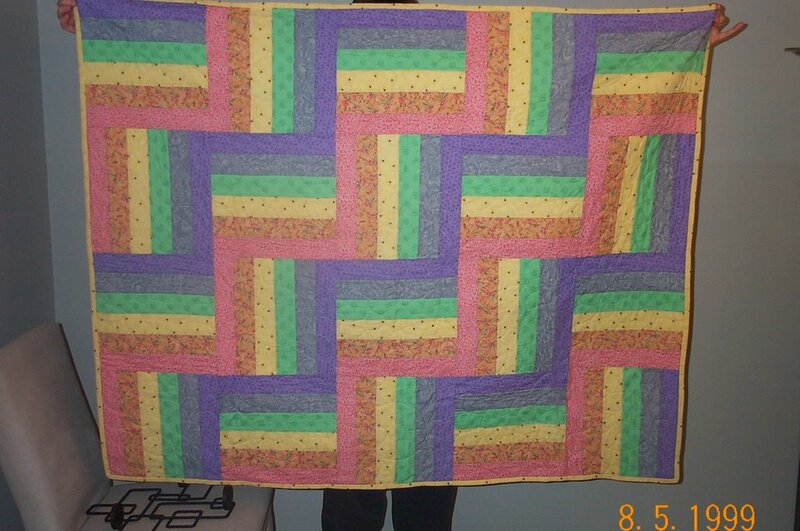 I pulled out my batik fat quarters and made her a Yellow Brick Road for her birthday. It took me a while to place the room in the photo -- it's her family room. I must have taken the photo when we were visiting for Thanksgiving. 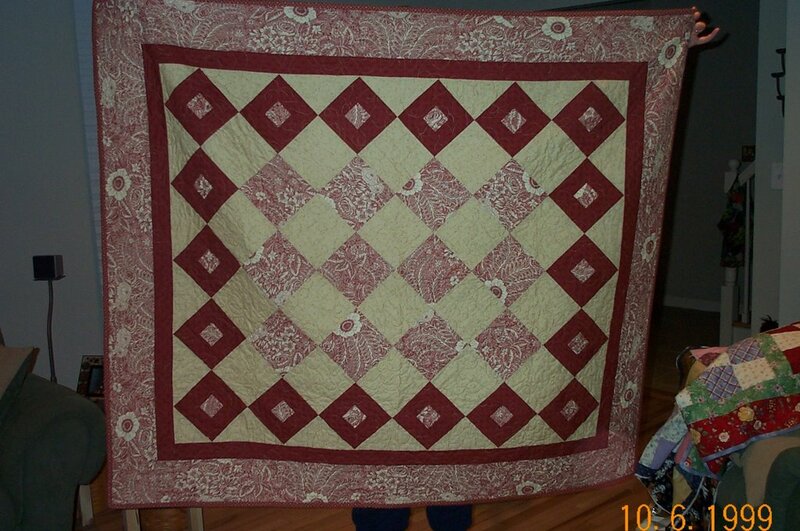 Most of the quilts I make are simple (photographs do not lie). 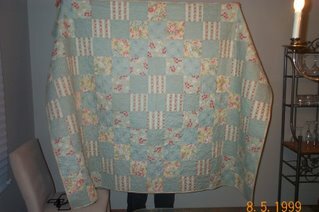 Most of the quilts I make are given away. 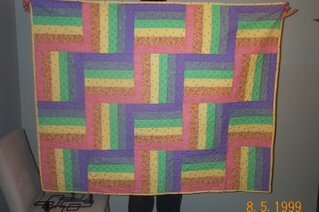 Most of the quilts I make and give away are given as graduation presents. This last photo is an all-purple all-batik Turning Twenty made as a Christmas present for a friend. She loved it. Blogger has decided that this is a sufficient number of photos for one post. I'll try and add more in another post at another time. I'm back. 100 quilts in 100 days = getting really, really sick for about 2 weeks at Christmas time. Oh, well. It was a vacation of a different sort, I guess. The day after Christmas I felt pretty lousy but decided to feel lousy in public instead of just feeling lousy at home. DH wanted to go shopping . I didn't have anything in mind but to my surprise I found my new best friend. I bought my trail running shoes last summer. They served me well, but it is definitely time for us to part ways. When I put these new shoes on, my feet started singing. (Really. Other shoppers stopped and listened. It was cool.) I despise shopping, really I do. The proof is that I bought THREE PAIRS (they were seriously on sale). I won't have to shop for running shoes for a year now!!! For the last week, about 3 times a day, I mention (completely out of the blue), "I love new shoes." My family just shake their collective heads and walk away quietly now. Do you know what else I love? New jars of peanut butter. You unscrew the lid, peel back the foil .... The aroma! The smooth texture with that little swirl in the middle! Not much in life is better. I also love Mondays. A whole new week spread out, empty and just waiting to be filled. The possibilities are endless. Mondays are wonderful days. These revelations are my way of saying "Happy New Year!" It's my favorite time of the year. Our family's biggest holiday is not Christmas or Thanksgiving ... it's New Year's Eve. Five days into this blessed New Year, I've accomplished little of importance. I'm still recovering from being sick and taking a lot of naps. But there are 360 more days of endless possibility spread out in front of me. 1. I could start exercising again. Actually I did on Thursday and I am SORE! Whoever said yoga was gentle should go after not exercising at all for nearly 4 months. 2. I could be really disciplined in my work and not be behind like I was for one. entire. year. 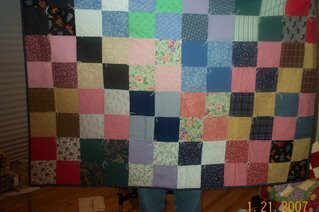 I started out this year owing people quilts, but I'm hoping for a calmer, gentler work schedule real soon. 3. I could remember that I am a child of God and live each day focused on Him and not on me. I think God likes the New Year, too. His whole plan of salvation is about wiping the slate and starting clean. He welcomes the repentant sinner and his mercies are new every morning. A small glimpse behind the curtain of my mind.